Through the promotion of the visual arts, the University Galleries educate and serve the University's students, faculty and staff, as well as the diverse communities of the surrounding tri-state area. The Merion Hall Gallery hosts seven shows yearly. The first six feature professional artists, who are mostly but not exclusively from the area. (Proposals are accepted, please see below.) The seventh is the Senior Arts Thesis Exhibition that highlights the year-long projects of the Senior Art Majors. The Boland Hall gallery selects an alumnus to exhibit at the beginning of each school year. The remainder of the year focuses on student work. We also feature the work of our summer scholar students frequently throughout the year. Receive email announcements when new exhibitions are coming up! Click here to submit artist proposals for the 2019-2020 exhibition schedule. The University Galleries are free and open to the public. Merion Hall is open on Saturdays 10 a.m. - 1 p.m.
We have limited hours during all University semester breaks. Please email jbracy@sju.edu for specific hours during breaks or appointments. The Merion Hall Gallery is located off of N. Latches Lane which is in the Lower Merion Twp. section of the University campus. 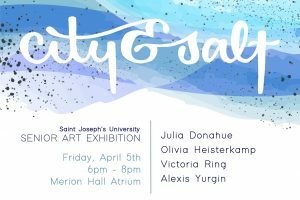 Merion Hall Gallery hosts six professional artist exhibits per year in addition to the senior art majors' thesis exhibition. The Boland Hall Gallery is located on Lapsley Lane just off of City Avenue also in the Lower Merion Twp section of the University campus. We kick off the school year with an exhibit featuring an alumnus. 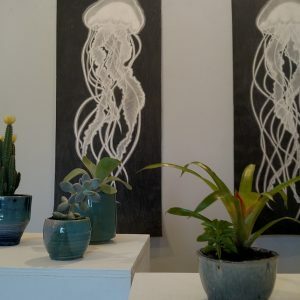 Following that show, the Boland Gallery rotates on a monthly basis with student work.